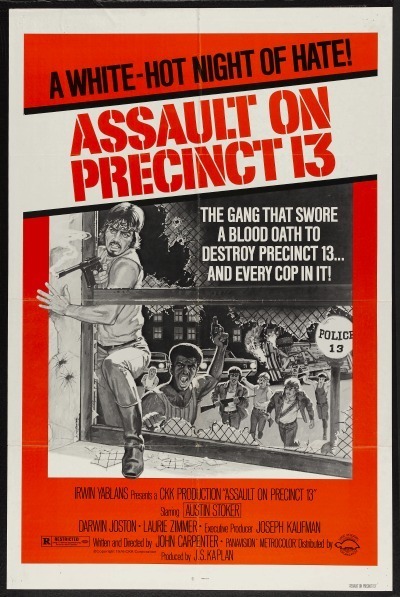 John Carpenter’s “Assault on Precinct 13,” is a wonderful, gritty, down and dirty, suspense/action movie. A group of misfits bands together to make final stand against an unknown group of attackers. Can’t get much better than that, can it? It is one of Lieutenant Ethan Bishop’s first days on the job. (Of course.) On his way into work, he is rerouted to Precinct 9, Division 13. They’re closing down the police station and they need Bishop to watch it for the night and, if anyone shows up, let them know that it’s no longer a functioning station and send them on their way. Of course, the office crew is skeleton as well, consisting of Officer Cheney and two secretaries, Leigh and Julie. They’re all thrown into a tizzy when a man races in, out of breath and hysterical. What he’s trying to tell them, (and can’t spit out,) is that his daughter was killed by Street Thunder, a local gang who just shot up an ice cream truck, the driver, and the young girl, (his daughter,) who just wanted a fudgicle. The man followed the gang and ended up shooting the one member that killed his daughter, but that only seemed to rile up the group even more. They chased after him. He ran into the police station. A botched prisoner transfer leads to a couple of murders alive and their police escorts dead inside the station. Now Bishop must keep everyone in the building safe, but also must defend it from the growing number of gang members outside. “Assault,” is inspired by the Howard Hawks movie “Rio Bravo,” which was best known for containing almost no close-ups. Carpenter, who allegedly really wanted to do a western but couldn’t find the budget, simply transplanted the story to the inner city. Everything about the movie, the acting, the sets, and the music seems cut-rate, compared to similar films from that period. However, it somehow all works. It all combines together to create a story that is tight, suspenseful, and engaging.